Incorporating wood chip mushroom beds into your garden is a perfect opportunity to be creative and experiment a little! There are many different locations to make beds such as pathways, around the base of trees, in vegetable beds etc. and different techniques for building them (depth, width, layering, location etc). No matter what design you choose, make sure to consider the temperature, shade, moisture and substrate requirements of the species you want to ‘plant’. 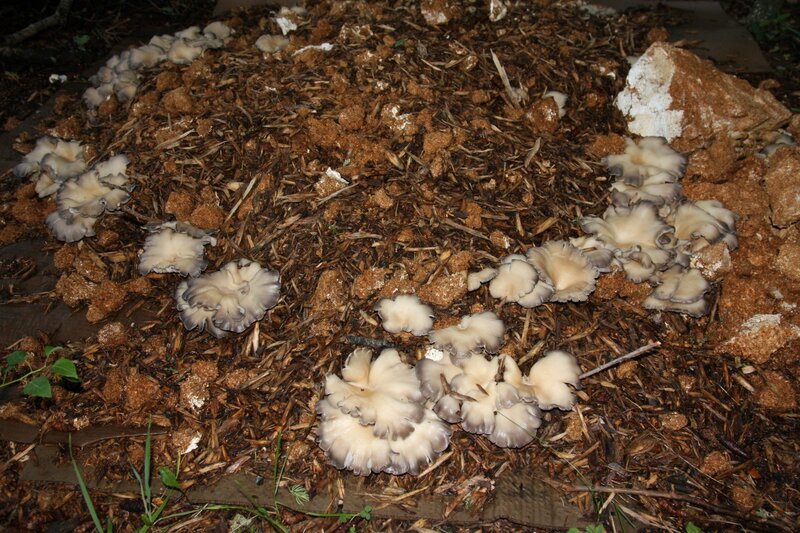 Primary decomposer fungi species (wood decay and litter-decomposers) such as oyster mushrooms (particularly blue and pearl) and King Stropharia are good species to start with in our climate. Wood chips should be relatively fresh to minimize competition with wild fungi and should come from trees harvested in the spring before the trees leafed out. If they seem a little dried out, make sure to pre-soak them. For example, place chips in a burlap sack and soak them in a food safe 55 gallon drum for 1.5 hrs. Step 5: Cover the bed. However, you may want to experiment a little. If you have multiple beds and/or strains of mycelium, try to cultivate the most resilient for your environment. Let it fend for its self. Tough love! The timing from when you set up your bed until your first harvest and the success of the bed will depend on the species you cultivate and the microclimate of your site. Expect up to 9 – 12 months. If you plant in the spring you may get a flush later that summer/fall. If you plant in late summer/fall, be prepared to not see the fruits of your labour until after a spring rain! Experiment and learn by planting a whole bunch of beds, some might not work, some will need more tending than others, and some will be fantastic! For those beds that produce very well, think about cutting out a piece of the bed (like out of a pie) and transplant it to a new location to establish a new bed. Choose an area that you do visit somewhat frequently – once the mushrooms start to pin, they will grow very quickly! All sorts of insects will also enjoy the mushrooms – it can be a challenge to harvest them at the right time!